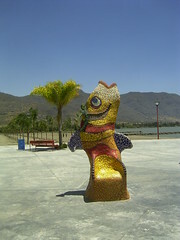 Officials including Jalisco Governor Emilio Gonzales and Jocotepec Mayor Felipe Rangel inaugurated the newly improved Jocotepec Malecon, including the colorful mosaic-encrusted fish sculptures and fountains. A wonderful pedestrian walkway wraps around the horbor where boats can easily dock. Speaking of docking the Fiesta Lago de Chapala tour boat docks at this very dock and treated the Governor and Major for a short ride along the Lake Chapala shoreline. The Governor also had some other more serious official business to take care of while in the area. Along with Major Rangel he officially opened the new Hospital de Urgencias. The new Emergency Hospital will have three examination rooms, a treatment room, shock room, x-ray room, pharmacy, waiting room and office space. Initially there will be eight beds for in-patient hospitalization and a four-vehicle ambulance fleet. Previously Jocotepec had to rely on the Cruz Roja Mexicana (Mexican Red Cross) ambulance service based in Chapala. So, Congratulations to all the government officials who helped make the new hospital a possibility and to all the workers and staff and others who helped make the new hospital a reality. How Much Does an Emergency Ambulance Call Cost at Lake Chapala Ajijic Mexico? What’s the Pollution Score for Lake Chapala? I was reading an article about an american expat that had his gall bladder removed a Guadalajara hospital. My question is what type of procedure was done. Here in the states they now take the gall bladder by laparoscopy not the old way with incision and rib destruction. I’m concerned about the methods used in Mexico because we are considering moving down from Seattle, WA soon and I really haven’t been able to find out much about the procedures that are done there and how they are done. Really would appreciate any info you can give me. Hi Maxine, Thanks for your comment. I know we have great doctors here and in nearby Guadalajara, but I wanted to answer your specific question so did a bit of research and as I suspected the doctors in our area are totally up to speed on the procedure you mentioned and other non invasive surgeries as well. So, thinking that others may have the same or similiar questions I decided to write an article which should be published about the same time as you read this response. It will be under “Living”. 1. How many ambulances do they have and what equipment is on board. Also, do they all have EMT’s and do they speak English? 2. How many beds does the hospital have and what treatment do they offer? 4. Do the physicians speak English and what is their cost? Lastly, where is the hospital located? Hi Terry, Sorry, but I don’t have this information. I’ve not visited the hospital there. Here’s an educated guess. The hospital will be more like a small clinic. Probably some of the staff will be bi lingual, but not the majority. Not sure about the equipment. Jocotepec is at the far West end of Lake Chapala about 20 + miles from my house. If you come for a visit we can go out together and investigate. I hope that someone who lives in that area can supply us with more information.